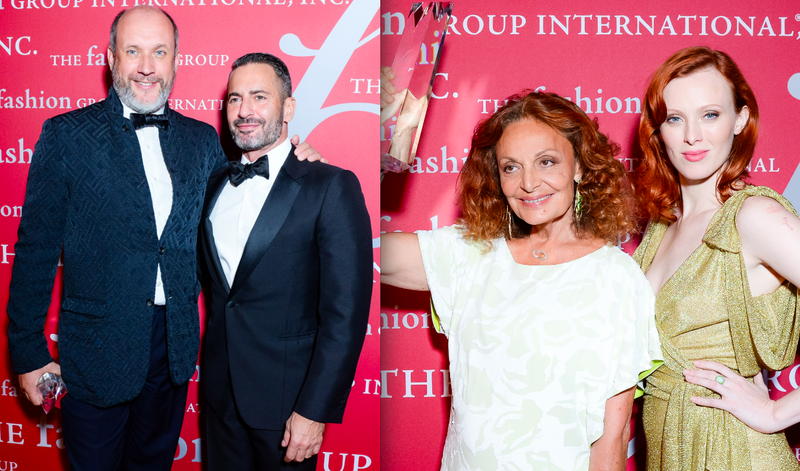 Fashion Group International’s 31st annual FGI Night of Stars was held last night at Cipriani Wall Street, and once again the organization brought out the biggest names in the industry to the sit-down dinner. This year they honored 12 “Protagonists” in the biz. The latest crop was comprised of Sarah Burton (Fashion Star), Glenda Bailey (Lord & Taylor Oracle), Diane von Furstenberg (Superstar), Roger Schmid for Natura with the Sustainability honor for Fossil (Corp Leadership), Elie Tahari (Brand Vision), Joseph Altuzarra (Fashion Star), Peter Copping (Fashion Star), Carol Hamilton (Beauty Star), and William Sofield (Interior Design Star). Karen Elson presented DvF with the night’s highest achievement, the Superstar honor, and asked the crowd to get on their feet to congratulate her. “I guess this is what happens when you get older! People get up for you!” DvF quipped. Fittingly, the evening ended with DvF sharing memories about her good friend Oscar. “Every Saturday night, he would come to my house to have Saturday night chicken. We would watch a movie and I would be next to him on the sofa. Two Saturdays ago, it was getting harder and harder for him to do it. He had driven from Connecticut to come to the hospital here for a blood transfusion. Annette [de la Renta] said they couldn’t come to [dinner], but he did come. When he sat on the sofa he said, ‘I’m so glad I made it again.’ That was the last proper meal he had. Today I would like to speak to all of you as if Oscar was speaking to all of you. He loved life, he really, really did. He loved to sing and he loved flowers and beauty. He loved to be mischievous and make fun of people. He was the best gossiper and the only way we can honor him is by all of us loving life and fashion and gardens and being full of life and enjoying life and the wonderful person he was. I don’t usually cry.” DvF finished her speech welcoming Copping to New York and the OLDR house telling the crowd how proud Oscar was of his choice. A warm welcome to a new star in town.